This post is USED FOR INFORMATION PURPOSE ONLY and is dedicated to the exciting games of DRAUGHTS WORLD CHAMPIONS OF INTERNATIONAL DRAUGHTS (10 x 10 BOARD), WHICH IS BASED ON WORLD DRAUGHTS FEDERATION (FMJD) RULES (i.e. Based on the majority capture rules). The games are inclusive of games from International Masters (MI) and International Grand Masters (GMI) (BOTH MALE AND FEMALE CHAMPIONS) to serve as a guide and inspiration to players. Players are no doubt familiar/or had viewed the games of the various world champions in VIDEOS and OTHER FORMAT(S). 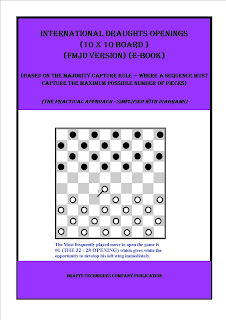 We present these exciting games in a format we would like to call "GAME SHEET FORMAT" which is an unorthodox way to view and study these Highest Level Games by means of a step by step diagrammatic representation of the moves of these VARIOUS TOP TOURNAMENTS AND WORLD CHAMPIONSHIP GAMES in a way whereby the Openings, through the Middle Games and The End Games (in short, the whole spectrum of the game) could be VIEWED AND STUDIED IN A "BOOK FORM" to help players improve in their judgement/moves when playing. Furthermore, it enable players to have an in-depth study of the games of these various champions. The purpose of this post is to enable players to VIEW THESE GAMES IN A DIFFERENT FORMAT TO ENABLE THEM ANALYSE WITH EASE ANY STAGE OF THE GAME FOR EASY UNDERSTANDING. Note that in the GAME SHEET(S), we will not include the notations for now, because these (notations) are played out in the various videos. The GAME SHEET(S) instead will be based on arrows to depict the movements of the players. The games selected no doubt are guaranteed to assist players in their judgement when playing. Note the Champions are selected randomly. Let the Games Commence!!!! (1) GMI ALEXANDER GEORGIEV - WORLD CHAMPION - 2002, 2003, 2004, 2006, 2011, 2013 (Two Times) and 2015 (Two Times). To learn more about GMI Alexander Georgiev Click here. GAME SHEET 1 - ALEXANDER GEORGIEV VS HARM WIERSMA AT THE WORLD CHAMPIONSHIP RAPID KNDB 1999 ROUND 7. 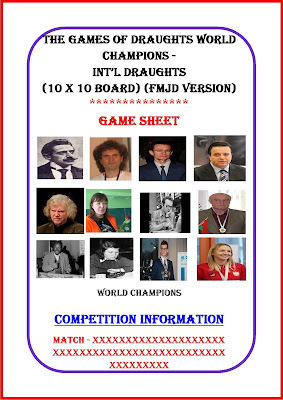 GAME SHEET 2 - TON SIJBRANDS VS ALEXANDER GEORGIEV AT THE WORLD CHAMPIONSHIP KNDB 2003 ROUND 11. GAME SHEET 3 - ALEXANDER GEORGIEV VS VIACHESLAV SHCHEGOLEV AT WMSG INTERNATIONAL DRAUGHTS 10 X 10 MEN FORBIDDEN CITY 2008 ROUND 3. (2) GMI ALEXANDER SCHWARZMAN - WORLD CHAMPION - 1998, 2007, 2009 AND 2017. To learn more about GMI Alexander Schwarzman click here. GAME SHEET 1 - ALEXANDER SCHWARZMAN VS YGAL KOYFMAN AT THE CHAMPIONSHIP OF THE USSR 1988, ROUND 7. GAME SHEET 2 - VIACHESLAV SHCHEGOLEV VS ALEXANDER SCHWARZMAN AT THE CHAMPIONSHIP OF THE USSR 1991, ROUND 9. GAME SHEET 3 - ALEXANDER SCHWARZMAN VS ALEXANDER GEORGIEV AT THE WORLD CHAMPIONSHIP, ABIDJAN IN COTE D'IVOIRE 1996, ROUND 1. GAME SHEET 4 - JEAN MARC NDJOFANG VS ALEXANDER SCHWARZMAN AT CANNES OPEN 2007, ROUND 3. GAME SHEET 5 - ALEXANDER GEORGIEV VS ALEXANDER SCHWARZMAN AT THE WORLD CHAMPIONSHIP (SCHWARZMAN - GEORGIEV) TALLINN 2013, ROUND 3. (3) GMI TON SIJBRANDS - WORLD CHAMPION - 1972 - 1973. To learn more about GMI Ton Sijbrands click here. GAME SHEET 1 - BABA SY VS TON SIJBRANDS AT RDG TOURNAMENT WHDB 1967, ROUND 3. GAME SHEET 3 - TON SIJBRANDS VS MARCEL DESLAURIERS AT THE WORLD CHAMPIONSHIP KNDB 1972, ROUND 14. GAME SHEET 4 - TON SIJBRANDS VS ANDRIS ANDREIKO AT THE WORLD CHAMPIONSHIP MATCH (SIJBRANDS - ANDREIKO) KNDB 1973, ROUND 17. GAME SHEET 5 - WIM VAN DER SLUIS VS TON SIJBRANDS AT THE EUROPEAN CHAMPIONSHIP, LIVORNO, 1967, ROUND 1. (4) ZOJA GOLUBEVA - WOMEN'S WORLD CHAMPION - 1986, 1988, 1990 to 1992 and 1994 to 2000, 2013 (Twice), 2015 and 2017. Unarguably the Strongest Draughts Queen!! To learn more about GMIF Zoja Golubeva click here. GAME SHEET 2 - ZOJA GOLUBEVA VS KRISTINE RIMSHA AT THE WOMEN'S WORLD DRAUGHTS CHAMPIONSHIP, BAMAKO, MALI ON 16 DECEMBER, 1995, ROUND 1. GAME SHEET 3 - AD VAN TILBORG VS ZOJA GOLUBEVA AT NIJMEGEN OPEN NK KNDB, 24 JULY, 2000 ROUND 3. GAME SHEET 4 - AUKE SCHOLMA VS ZOJA GOLUBEVA AT THE EUROPEAN CHAMPIONSHIP, KNDB 11TH NOVEMBER, 2002, ROUND 4. We are making conscious efforts to bring to you some games of top players of the version. As soon as this is done we shall post them for your delight. Please bear with us!!! ALL materials presented on this post are copyrighted by their respective copyright owners and are subject to USE FOR INFORMATIONAL PURPOSE ONLY. If you (Being the copyright owner) do not approve your material to be presented in this way on this site (or would like any additional information to be published), please contact us (via our email - info@draftstechniques.com) and we will remove it immediately (or add the necessary information)! We thank you in advance for your understanding! !